Pierre, S.D.—A former state senator’s book published by the South Dakota State Historical Society has won honorable mention for ForeWord Reviews’ Book of the Year Awards. Tom Dempster’s North of Twelfth Street: The Changing Face of Sioux Falls Neighborhoods features the changing landscape of Sioux Falls through Dempster’s beautiful photographs and insights into his hometown. The South Dakota State Historical Society Press published the book in 2012. ForeWord Reviews presents the awards to the best works coming from today’s independent, university and small press communities. "The book is an offering to my Sioux Falls. I am thrilled and thankful for this award," said Dempster. 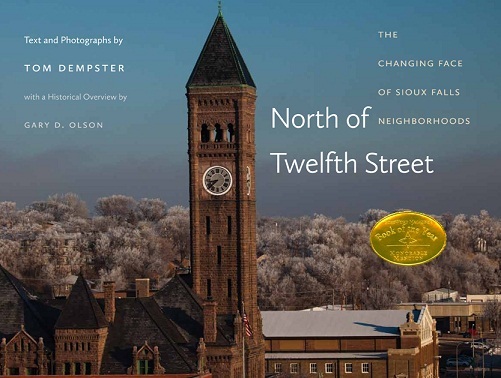 In North of Twelfth Street, Dempster focuses his lens on the city’s oldest and most diverse districts. With his book, Dempster provides a window into some of the best-known buildings in Sioux Falls and the lives of those who live and work in these neighborhoods. Gary D. Olson places Dempster’s stunning photographs in context with an essay on the area’s historical foundations. “Tom Dempster has created a superb reference to Sioux Falls, and this honorable mention recognizes the value of his efforts,” said Jay D. Vogt, director of the South Dakota State Historical Society. Two other State Historical Society Press books—Waiting for Coyote’s Call by Jerry Wilson and A Marvelous Hundred Square Miles by Suzanne Barta Julin—have also been finalists for the ForeWord Reviews Book of the Year Awards. Dempster, who lives in Sioux Falls, served as a Minnehaha County commissioner for nine years and in the South Dakota State Senate from 2001 to 2010. His photography is found in museums and private collections throughout the region. Olson is a former academic dean and professor of history at Augustana College in Sioux Falls. North of Twelfth Street: The Changing Face of Sioux Falls Neighborhoods is available for $34.95 plus shipping and tax and can be purchased from most bookstores or ordered directly from the South Dakota State Historical Society Press. Visit sdshspress.com or call (605) 773-6009. The South Dakota State Historical Society is a division of the Department of Tourism. The Department of Tourism is comprised of Tourism, the South Dakota Arts Council, and the State Historical Society. The Department is led by Secretary James D. Hagen. The State Historical Society, an Affiliate of the Smithsonian Institution, is headquartered at the South Dakota Cultural Heritage Center in Pierre. The center houses the society’s world-class museum, the archives, and the historic preservation, publishing and administrative/development offices. Call (605) 773-3458 or visit history.sd.gov for more information. The society also has an archaeology office in Rapid City; call (605) 394-1936 for more information.